ACID MEMBERS Fiesta Collectables Limited (“Fiesta”) has successfully handled an intellectual property (IP) rights issue with Nemesis Now Limited (“Nemesis”), demonstrating how keen vigilance and IP awareness can reap dividends. During Spring Fair 2008, Andy Kingston of Fiesta contacted the ACID stand because he had noticed (during set-up) that Nemesis were exhibiting “Green Lady” wall decorations which he believed were identical to the Fiesta “Green Spirit” wall decorations. 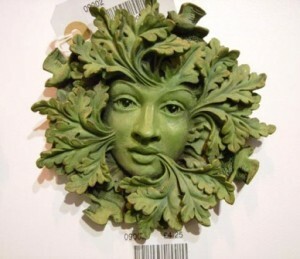 ACID Accredited law firm Hammonds LLP conducted an initial review of the products, and considered there was a prima facie issue for Nemesis to answer so, together with Dids Macdonal initiated the ACID exhibition protocol to communicate Fiesta Green Spirit the complaint to Nemesis. 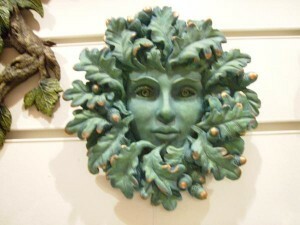 Andy Kingston of Fiesta said, “Following contact by Fiesta, Nemesis acknowledged the existence of the intellectual property rights in the “Green Spirit” design, designed by David Lawrence and exclusively licensed to Fiesta, and has withdrawn the “Green Lady” wall decorations from sale. I have worked with David Lawrence for several years. For successful companies like Fiesta, the designers with whom we work are our lifeblood and we are pleased that Nemesis has acknowledged the existence of his intellectual property rights in the Green Spirit wall decorations”. Dids Macdonald, ACID’s CEO said, “Fiesta Collectables have endorsed the aims and objectives of Anti Copying in Design for many years. Andy Kingston’s support for designers and artists demonstrates the core ethos of original design – respect”. ACID member, Smallbone& Co (Devizes) Ltd, has successfully enforced their UK registered design and unregistered design rights in a kitchen island, part of the companies popular ‘Walnut and Silver’ kitchen. 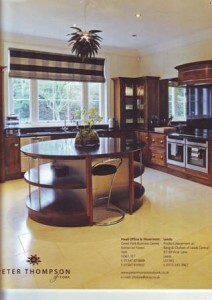 Smallbone was surprised to find an advertisement in Devine magazine by Peter Thompson of York, Ltd promoting a kitchen which included an almost identical island. Smallbone takes the creation and protection of its designs extremely seriously and had obtained a UK design registration for the island. The products innovative design was also protected by UK design right. A letter before action avoided litigation and as a result, Smallbone obtained undertakings from Peter Thompson of York which included a witness statement confirming the extent of sales of the kitchen island in issue plus payment of its costs. 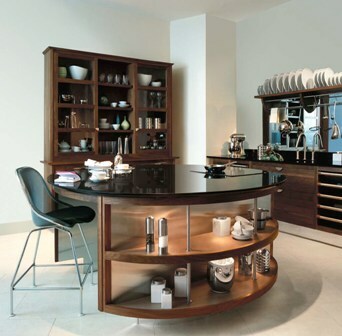 Commented Sally Wilkinson, Managing Director of Smallbone of Devizes, “We spend a significant amount of time creating our kitchen designs and the signature pieces of furniture within each kitchen design. We protect our designs through registered design protection and also enforce our unregistered rights. As a result, we are not prepared to allow others to take advantage of our novel designs and, as in this case, we took immediate action”. Adds Dids Macdonald, CEO, ACID, ” Smallbone of Devizes are highly influential market leaders and their anti-copying strategy is a great model for any manufacturer committed to innovative, original design. Like Smallbone, we encourage all our members to send a clear message out to market that plagiarism will not be tolerated”. Recently joined ACID member, Buggy Baskets, design and sell accessories for infants and storage solutions for strollers. Concerned by a sudden drop in sales, Partner Vicky Mostran, assessed the market and noticed that one of their competitors, Mama Delight, were selling items which looked remarkably similar to their own. The products in question were the Double Pocket Basket, Wedge Stroller Bag and Raincover Bag. A letter before claim was sent by McDaniel & Co, one of ACID’s Accredited law firms, and the products were immediately removed from the shelf but then appeared on E bay. Buggy Baskets used the VerO programme to have the listings permanently deleted. Image reproduced by kind permission of Shepperton Design Studio Ltd. The High Court has handed down it’s decision in Lucasfilm Ltd and others v Ainsworth and others, the “Star Wars” case. It concerned a dispute about props created for the 1977 film “Star Wars IV – A New Hope”, in particular the iconic white helmet and armour of the Imperial Stormtroopers. In 1976, the Defendant Andrew Ainsworth, was commissioned by the Claimants to produce the helmet, armour and other items (“the props”). He produced these using vacuum-moulded plastic working from paintings of the characters, drawings and clay models produced by the Claimants. In 2004, Ainsworth began selling his own replicas, producing these from the original moulds and tools which he had retained. His website contained statements like “made by the original prop-maker from the original moulds”. The Claimants sued for copyright infringement, passing off and, if the UK copyright claim was unsuccessful, infringement of US copyright. The props were not artistic works. They would have to be sculptures or works of artistic craftsmanship. Regarding sculptures the Judge outlined that although no artistic merit is required, artistic purpose is. He gave an example of some bricks on display at Tate Modern which could be a sculpture. The same pile, left on his drive by workman was not. The props were produced to identify the film characters, they had no artistic purpose. With artistic craftsmanship whilst the props were acts of craftsmanship they were not artistic. Their purpose was not to appeal as aesthetic but to convey the film characters. Section 51 CDPA 1988 provided a defence to any copyright in the drawings and paintings as they were design documents for the props. The Judge dismissed the passing off claim (based partly on the website) as Ainsworth was not seeking to sell his goods by reference to someone else’s goods or goodwill. The Claimant succeeded on its US copyright claim as Ainsworth’s defence would have been that the items produced were utilitarian/functional items (under US law no infringement). It was accepted the Claimant’s had the better case on this point in reference to US jurisprudence. At the moment the maximum fine that a Magistrate can award for online copyright and trade mark infringement is £5000. The UK-IPO has recently issued a consultation on increasing the level of penalties from £5000 to £50,000. This follows recommendation 36 by the Gowers Report on intellectual property to Government. Whilst ACID welcomes all opportunities to raise awareness about IP theft and improve penalties for online copyright infringement, it still leaves designers out in the cold. There are no criminal sanctions for design right infringement. Put quite simply, what is the difference in criminality between ripping off an artist (who creates a copyright work) and a furniture designer (who creates a design)? They should both be treated equally as both input tremendous skill and effort into their creations. There exists no deterrent of criminal sanctions for those people who systematically exploit designers work. ACID comments, ‘The Better Regulation Principles maintain that Government action has to be “consistent” so BERR is clearly failing to meet that requirement. ACID has consistently, over the last 10 years, put forward arguments to Government and, subsequently to Gowers, to address the disparity between copyright/trade mark and design right holders, ACID has yet to be given the counter argument why they should not be given parity and consistency regarding criminal sanctions’. Penalties for Copyright Infringement consultation document. Click here to download Gowers recommendation 36. ACID, (Anti Copying in Design) has formed a trade association partnership with the Shop and Display Equipment Association (sdea) to help raise the profile and value of IP among its members. This move is part of an on-going campaign by ACID to actively support trade organisations pan industry. Through IP education how to protect your designs and how to integrate IP as part of a corporate or marketing plan – ACID will advise sdea members on creating a safer trading environment by protecting their design equity through a robust IP strategy. To learn more about sdea click here to enter the Trade Association Partners section. The recently rebranded Furnisher magazine, (formerly Retail & Professional Furnisher) has joined 18 other key trade titles to become an ACID media partner. As a design-led interiors industry magazine, The Furnisher is totally in support of ACID’s aims and objectives in fighting design theft. Now eight years old, The Furnisher continues to reflect the whole of the interiors industry presenting products, manufacturers, suppliers and services predominantly to a readership of retailers, buyers, specifiers and interior design businesses. See our first entry from RCA trained designer Laura Fletcher (below)on the new Member Contact page. Firm supporter and long-standing member of ACID, Elizabeth Gage, leading Jewellery designer and favourite with fine jewellery collectors world-wide, has a policy of archiving every jewel she sells. A policy heavily endorsed by ACID who encourage all their members to store copies of their designs in the ACID design data bank – which currently holds over 300,000 designs! ACID comments: ‘All designers should take a leaf out of Elizabeth’s book. Archiving copies of original work proves ownership and provides an audit trail should the originator be unlucky enough to be copied”.